This week we hosted another of our regular Analytics Labs Showcase and Start-up events in Manchester. The event was attended by over 90 people including Labs participants and invited guests. Our audience included colleagues from the Department for Education and Universities UK. Once again, the demonstration by outgoing Labs participants of proof of concept Analytics Labs data visualisations did not disappoint. Participants continue to rise to the challenge that is set them by laying enthusiasm, creativity and commitment on to a foundation of sector, data and visualisation experience and skill and creating some excellent outputs. Feedback from the expert panel and the audience was very positive. To pick just a handful of comments from the panel; teams had produced proof of concept data dashboards that were, individually, ‘eye catching’, ‘bold’, ‘polished beyond what was expected’ given the time available. The panel also fed back that the dashboards were able to, ‘tell a story simply and clearly’ and ‘raise questions’. The teams were formed in October 2018 and members, largely, had not previously met their new colleagues. It is always quite remarkable how individuals within the teams quickly gel and work together to achieve common goals. It is particularly interesting to note that individual participants are based across the four UK nations and much of the work is done remotely. We know from previous experience that the professional and personal networks that have developed will continue as participants share contact details with each other and join the Analytics Labs Alumni group. We do hope that the teams who have just begun their Analytics Labs experience will feel similarly when they demonstrate their outputs at the Showcase in May. Welsh Insights – exploring the factors of most interest to Welsh Higher Education Providers. Professional Teaching Qualifications – looking at teaching qualifications amongst the HE staff workforce with related trends and associated benchmarking. What are the downstream effects of particular tranches of research funding, from research activities and collaborations, through outputs and their reach and use, to research outcomes, impact and the contribution of research to wider economic and social change? What factors affect how research practices, that are intended to protect against bias in experimental research, are reported? We’ll post updates on how the teams and their outputs develop and highlight upcoming opportunities to join Analytics Labs, soon. Posted by Janette Hillicks on February 8, 2019 in Uncategorized. This is something of a bumper post on recent developments in Analytics Labs. Analytics Labs activity – outgoing and incoming teams and upcoming recruitment activity. An opportunity for previous Labs participants to join our new Alumni group. International competitiveness – covering student recruitment, staff recruitment and retention and international league tables. The Research Excellence Framework (REF) – a tracking tool covering REF2014 benchmarking, the research environment and REF 2021 preparation insights. Student residences and Estates – including explorations of regional and characteristic variations in where students live, commuting patterns and accommodation trends. The Knowledge Exchange Framework (KEF) – the team worked together with Research England on exploring KEF metrics themselves and how insights could be gained from their use. Learning Analytics – exploring the potential for BI in this big data area. The proof of concept dashboards were very warmly received by an audience of 100 peers and experts. We will be taking the feedback from the day and the proofs of concept and giving consideration to how they may be taken forward. Diversity – includes exploration of equality accreditation including Stonewall and Gender Pay Gap, Athena Swan, Race Equality Charter. Finance – looking at financial sustainability and a range of financial health measures. Learning Analytics – building on previous work – continuation of existing use of big data for student engagement benchmarking and insights. Well-being – an important area that has increasingly wide interest. Potential outputs may include tools to assist resource planning and overall impact measurement. The teams are hard at work and will report back to a Showcase event on 6 February. We have a new cohort of Analytics Labs running from 6 February 2019 – w/c 13 May 2019. Professional Teaching Qualifications Lab. Explorations into teaching qualifications amongst the HE staff workforce with related trends and associated benchmarking. Welsh Insights Lab. Explorations into the factors of most interest to Welsh Higher Education Providers. What are the downstream effects of particular tranches of research funding, from research activities and collaborations, through outputs and their reach and use, to research outcomes, impact and the contribution of research to wider economic and social change? We understand this is a difficult and long-standing question, and we are looking for novel sources and uses of data to address it in new ways. Q1: What factors affect how research practices, that are intended to protect against bias in experimental research, are reported? The theme would explore practices including randomisation of samples, blinding, allocation concealment, sample design, specification of primary outcome. Factors might include sub-discipline, research funders and their policies, and/or the journal policy with respect to the use of reporting guidelines. Q2: Given the current UK Government’s ambition for investment in Research and Development to reach 2.4% of GDP by 2027, what factors correlate with increases in business investment in R+D in collaboration with universities? We’re looking for team analysts with interest and experience in the themes alongside Tableau and/or Alteryx (or related) experience. We’re also looking for suitably experienced team leaders/product owners to lead the themes. Check out or post on Analytics Labs, its benefits and how to get involved. Interested? We’re taking applications using this application form. We know from feedback that the friendships and networks forged during the Analytics Labs experience have continued beyond the three months of Labs activity. Having spoken to a number of past participants we knew that there was some demand for providing a platform on which past participants could keep in touch – with each other and with developments within the Labs service itself. We’re delighted to say that we have launched an Analytics Labs Alumni group. Initial membership numbers are very encouraging with over 100 on board, but of course we’d love to have more of you involved. So, if you have previously been an Analytics Labs/Heidi Labs or equivalent participant and would like to join us then please email us and we’ll be in touch. Further details can be found in this blog post. We’ve some exciting dashboard suites for release in early 2019. Watch this space! Posted by Janette Hillicks on November 15, 2018 in Uncategorized. What could it mean for your own career development? Analytics Labs is an exciting research environment within which we co-design new data derived products and services with our members and other customers. We focus on themes that are determined by an established stakeholder group. It is offered free to Jisc and HESA members. We are looking for strong data analysts (with experience in Tableau and/or Alteryx or related products) to join our agile analysis teams and develop proof of concept outputs for redevelopment and release to a wider audience. In return participants are supported to develop their existing skills. We are also looking for team leaders/product owners. These will be heads, assistant heads or similarly senior roles who will be responsible for guiding their team in the creation of outputs for demonstration by the team at a showcase event at the end of the cycle. Innovating through collaborative working, for example across institutional functions. Team leader/Product Owner – Steers their team towards creating widely applicable outputs for demonstration at the end of cohort showcase event. Again, this role provides the opportunity to gain/enhance professional development experience in a number of areas, including providing leadership in a largely remote working environment. We anticipate the effort to average out at around 8 days for an entire twelve-week development cycle (this includes 5 days of face to face activity – start-up, showcase plus 3 team meetings). On successful completion of Analytics Labs, we’ll ask you to take part in a showcase event to demonstrate the outputs to peers and a panel of experts. We award you a digital credential and invite you to join our analytics labs alumni forum. As a forum member you’ll receive unique offers, see early previews of new service content and have an opportunity to influence it. There is no charge to take part, however participants are expected to cover their own travel and subsistence costs when attending face to face project meetings. Further details on Analytics Labs and the benefits of getting involved can be found on the Jisc Business Intelligence web page. What happens to the outputs of Analytics Labs activity? All outputs are demonstrated to peers and representatives of the wider community at a showcase event. The most promising dashboards and visualisations for higher education use are fully redeveloped by in-house staff into highly valuable dashboard suites designed to help with easy exploration and decision-making within the sector. These are released through HESA’s Heidi Plus HE intelligence platform as ‘Community Dashboards’. Previous Analytics Labs participants have delivered insights into a range of areas including HE finance and the impact of Brexit, league tables, postgraduate teaching tracking and tracking the student journey and we’re always looking to build on and develop some areas and explore others. Application is open to Jisc Higher Education members only. Further details on Analytics Labs and the benefits of getting involved can be found on the Jisc Business Intelligence web page. Please email us if you have any queries/would like to hear more about how to apply. We have been running Analytics Labs (previously known as Heidi Labs) since late 2015 and since that time we have had 290 participants join us from 109 UK Higher Education Providers (including 11 Alternative HE Providers). Previous participants have contributed so much to the development of Analytics Labs and future development of community dashboards. We know from feedback that the friendships and networks that have been forged during the Labs experience have continued beyond the 12 weeks of Labs activity. We’d like to encourage the continuation of those established connections and also provide the opportunity to nurture new relationships with previous Labs participants from across the sector. To do this we’re launching an Analytics Labs Alumni group. Networking possibilities – not only with your own Labs team and cohort but across the whole Analytics Labs ‘family’. The opportunity to interact with sector colleagues from across the spectrum of interests and disciplines, all of whom have a shared experience of Labs and an interest in data and business intelligence. The chance to gain early sight of developments in outputs from Analytics Labs, with the opportunity to apply to beta test outputs with colleagues. Being on the ‘inside track’ with potential to feedback on the benefits of related activity for your organisation and the sector. If you have been a participant in any of the previous Analytics Labs/Heidi Labs/other related Labs activity and would like to be included in the Alumni Group then please email us and we’ll be in touch. Please note that we will be closing our previous team Basecamp sites by 16 November 2018 at the latest and replacing them with one Alumni space. This will ensure that those people who want to continue to keep in touch with Labs-related activity and developments can do so in one place. Posted by Janette Hillicks on October 19, 2018 in Uncategorized. We’ve already received some excellent applications for the upcoming Analytics Labs and have been able to begin to shape up the order in which themed labs will run. We’ve also received feedback on the original deadline so we extended it. We’re currently recruiting for our popular Analytics Labs. So far we’ve had 246 participants from 95 higher education providers involved and are looking to recruit more to join us in working on some exciting new opportunities. We are also looking for team leaders, particularly for the February teams. These will be heads, assistant heads or similarly senior roles who will be responsible for guiding their team in the creation of outputs for demonstration by the team at a showcase event at the end of the cycle. Team leader – Steers their team towards creating widely applicable outputs for demonstration at the end of cohort showcase event. Again, this role provides the opportunity to gain/enhance professional development experience in a number of areas, including providing leadership in a largely remote working environment. We anticipate the effort to average out at around 8 days for an entire twelve-week development cycle (this includes 5 days of face to face activity – start-up, showcase plus 3 team meetings). When do Analytics Labs run? Applications are open now for both cycles. Diversity Lab – covering e.g. Equality accreditation, Stonewall and Gender Pay Gap, Athena Swan, Race Equality Charter, others. Could include staff and student body. Well-being Lab – we are seeing increasing interest in student wellbeing within the sector (various sources including BBC, Universities UK and WonkHE). Outputs might include benchmarking, resource planning and overall impact measurement. Financial sustainability Lab. Explore a range of financial health measures e.g. from providers and/or as set out by Council of University Chairs (CUC) and the Office for Students (OfS), Financial Sustainability Strategy Group (FSSG). To support University Executives in reporting to Governing Bodies. Please note: for acceptance on a Lab starting in October you must be available for a face to face start-up event in Manchester on Thursday 18 October 2018. Postgraduate research Lab – including time to completion, completion rates, supervision and staff profiles, etc. To complement work already done in Labs on PGT admissions and REF 2021. Professional Teaching Qualifications Lab – explorations into teaching qualifications amongst the HE staff workforce with related trends and associated benchmarking. Please note:for acceptance on a Lab starting in February you must be available for a face to face start-up event in Manchester in the week commencing 4 February 2019 (date to be confirmed). All outputs are demonstrated to peers and representatives of the wider community at a showcase event. The most promising dashboards and visualisations for higher education use are redeveloped by in-house staff into highly valuable dashboard suites designed to help with easy exploration and decision-making within the sector. These are released through HESA’s Heidi Plus HE intelligence platform as ‘Community Dashboards’. Application is open to Jisc Higher Education members only via an online form. This should take no longer than 10 minutes to complete. Amongst other things you will be asked to indicate the dates you are available, confirm that you are able to commit the time required and have your employer’s full support to do so; indicate the themes/areas you’d be interested in exploring and explain in 500 words or less your relevant experience/why you’d like to be involved. Applications close on 14 September 2018. We will notify all applicants of decisions as soon as possible after that date. We have an update on our latest call for applications for Analytics Labs. Wellbeing Lab – we are seeing increasing interest in student wellbeing within the sector (various sources including BBC, Universities UK and WonkHE). Outputs might include benchmarking, resource planning and overall impact measurement. Learning Analytics Lab – using selected ‘learning analytics’ data to improve mandatory data returns and performance metrics. Building on existing Lab and use of learning analytics data for student engagement benchmarking and insights. a cycle running from w/c 4 February to w/c 13 May 2019. Application is open to Jisc Higher Education members only via an online form. This should take no longer than 10 minutes to complete. Amongst other things you will be asked to confirm that you are able to commit the time required and have your employer’s full support to do so; indicate the themes/areas you’d be interested in exploring and explain in 500 words or less your relevant experience/why you’d like to be involved. We are delighted to announce that we are recruiting participants for the next cycle of Jisc’s popular Analytics Labs, running from week commencing 15 October 2018 through to week commencing 4 February 2019. Analytics Labs is an exciting research environment within which we co-design new data derived products and services with our members and other customers. It is offered free to Jisc and HESA members. We are offering an exciting and unique opportunity for data analysts (with experience in Tableau and/or Alteryx or related products) from across the higher education sector to join our agile analysis teams developing proof of concept outputs for redevelopment and release to a far wider audience. In addition to team members we are also seeking team leaders. These will be heads, assistant heads or similarly senior roles charged with steering their team towards creating widely applicable outputs for demonstration at the end of cohort showcase event. Again, this role provides the opportunity to gain/enhance professional development experience in a number of areas, including providing leadership in a largely remote working environment. We anticipate the effort to average out at around 8 days for an entire twelve-week development cycle (this includes 5 days of face to face activity – start-up, showcase plus 3 team meetings). Please note: you must be available for a face to face start-up event in Manchester on Thursday 18 October. Applications close on 29 August 2018. We will inform successful applicants during September 2018. We provide a technical and legal framework, including governance (advisory group who oversee and guide themed activity), data protection training, project management, technical and data consultancy; access to data for experimentation purposes and all software (supported by technical experts). What themes will the Analytics Labs be working on? Teams will be exploring the following themes, as determined via our established stakeholder group. In return participants receive support and further develop skills. Diversity benchmarking – covering e.g. Equality accreditation, Stonewall and Gender Pay Gap, Athena Swan, Race Equality Charter, others, may include staff and student body. Learning analytics – Using selected ‘learning analytics’ data to improve mandatory data returns and performance metrics. Continuation of existing use of learning analytics data for student engagement benchmarking and insights. Postgraduate research – including time to completion, completion rates, supervision and staff profiles, etc. To complement work already done in Labs on PGT admissions and REF 2021. Professional teaching qualifications – Use HESA Staff return data (ACTCHQUAL) possibly with data from HEA to profile number, percentage and trends of academic qualifications held at institution and by subject, benchmark with relevant groups. Financial sustainability dashboard and modeller – Operationalise range of financial health measures e.g. from providers and/or as set out by Council of University Chairs (CUC) and the Office for Students (OfS), Financial Sustainability Strategy Group (FSSG). Support University Executives in reporting to Governing Bodies. We will acquire the relevant data for these themes and support our teams in agile rapid proof of concept product development. All outputs are demonstrated to peers and representatives of the wider community at a showcase event. The most promising dashboards and visualisations for higher education use are redeveloped by in-house staff into highly valuable suites of product. designed to help with easy exploration and decision-making within the sector. These are released through HESA’s Heidi Plus HE intelligence platform as ‘Community Dashboards’. Enquire how to access Community Dashboards via Heidi Plus. It’s been a busy time on the Analytics Labs front. Here’s what’s been happening recently. Our second cohort of 2017/18 ran from February until May and we had 5 teams (43 participants from 38 higher education providers) working away on some interesting themes that provided some excellent proof of concepts to demonstrate to sector peers and experts at the Showcase event in Manchester. All demonstrations were provided with feedback by a panel of experts and a traffic light score was used an interactive voting app. Red = Do NOT take forward, Amber = Has potential for further development, Green = Would enhance Community Dashboard profile. A subject that is being hotly debated in the sector currently. Team members worked on “An analytical exploration into time series trend of degree classifications awarded with emphasis on recent claims of grade inflation versus other possible explanations”. The team Immersed themselves into this theme and designed dashboards and visualisations that modelled impacts for a range of roles from prospective students to vice chancellors. During their time with the team participants liaised with Universities UK on their work in this area and reported to the DfE on the activity. An example of the potential reach of some of the Analytics Labs work. Feedback on the day for the four visualisations demonstrated by the team provided an average of 86% of those voting felt they had potential for further development or would enhance the current community dashboard portfolio. Here the team looked at the theme from the perspective of a faculty/school/programme manager and a recruiter – considering both the viability of what was on offer and the recruitment pipeline and future strategy. The panel commented on the potential of the outputs to save an enormous amount of time and effort in course design and the possibilities offered around recruitment. 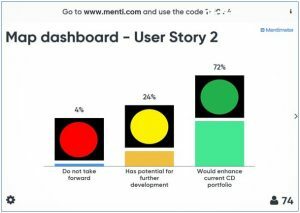 Feedback on the day for the eight visualisations demonstrated by the team provided an average of 92% of those voting felt they had potential for further development or would enhance the current community dashboard portfolio. The team took the perspective of a Departmental or Admissions Manager assessing recruitment and admissions positions and actions and a Senior Manager predicting future intake/income and deciding strategy accordingly. The panel commented on the impressive work that had been done here especially in looking at the PG experience. Feedback on the day for the seven visualisations demonstrated by the team provided an average of 78% of those voting felt they had potential for further development or would enhance the current community dashboard portfolio. Degree outcome and attainment by entry qualifications and BAME and WP indicators with ability to assess at TEF subject level. This team looked at a Director of Planning monitoring value-added outcomes over time, a senior manager assessing degree outcomes across the range of students and backgrounds, and a student support manager allocating resource for student interventions and support. Panel members were impressed and wanted to see how this area could be further explored. Feedback on the day for the four visualisations demonstrated by the team provided an average of 89% of those voting felt they had potential for further development or would enhance the current community dashboard portfolio. We welcomed our first team made up of colleagues from alternative higher education providers. The team was keen to provide an overview and introduction of alternative providers ‘a meet the APS’ dashboard was a key output of their work. They also looked at a range of roles including policy maker looking at their institutional offering and related funding and marketing targets, a planner benchmarking with other institutions, a marketing officer looking at marketing campaigns. The panel were once again impressed by the outputs from the team and comment was made that this experience provided the chance to ‘open the door’ on the alternative provider experience and build on understanding and the potential for collaboration across the sector. Feedback on the day for the four visualisations demonstrated by the team provided an average of 95% of those voting felt they had potential for further development or would enhance the current community dashboard portfolio. The showcase was the culmination of another three months of fantastic efforts by colleagues from across the sector. We also kick-started another Analytics Labs that is working as we speak and will be reporting back at a Showcase in Manchester on 18 October. We will be starting our Autumn cohort at that event – are you interested in getting involved? If so, watch this space, we’ll be telling you how to apply in the next few days. We’ve launched a new online presence for the service with details on what we offer and information on how to find out more. Here’s a great orientation slide deck including all the themes our teams are exploring throughout 2018.